As digital retail has grown, all of us have had online shopping experiences that fell short when our product arrived. The typical path of these less-than-satisfactory shopping experiences is the discovery of a product online, the purchase, anticipation, and ultimately the disappointment when the product arrives and isn’t what it was cracked up to be. Maybe the quality is poorer than it seemed online, or the clothing doesn’t fit at all like it did on the model in the webpage photos. It’s experiences like this that b8ta is helping shoppers and retailers avoid. While digital retail is undoubtedly important, the limited scope of what a website can show about a product can often leave shoppers wanting more. b8ta’s retail showroom directly combats the issue of unmet expectations by allowing customers to get a true feel for products prior to purchase. Scores of products that are absolutely dazzling when used in person may not be fully appreciated in an online store. This describes several of our partners’ products, including the Neo smartpen. Neo Lab Convergence, a b8ta partner since the first b8ta store opened in December 2015, sells an incredible pen of the same name; a pen that digitally captures and stores everything it writes down. Users connect the pen to their device via bluetooth and together with the Neo app they can sync and store notes, record audio, search notes, edit and more. The Neo smartpen is unquestionably a fascinating and useful product, and we recently sat down with Stephen Dix, the VP of Sales and Marketing and General Manager of Neo Lab Convergence, to learn how the b8ta experience has helped grow the Neo smartpen business. Stephen agreed; getting the Neo smartpen in front of customers is vital. At b8ta, we knew the Neo smartpen was a perfect product for our stores. We have the ability to show the Neo smartpen at work, and it’s certainly incredible. 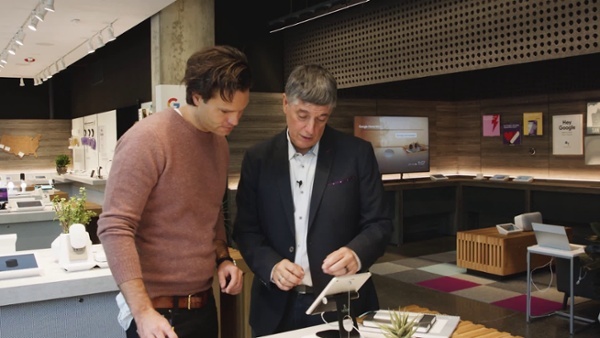 We love seeing people’s faces when they try it out for the first time, and the never-ending page of notes appearing on the connected demo tablet is fascinating at any b8ta location. Stephen went on to tell us more about how b8ta’s unique environment is beneficial to a hands-on product. A key ingredient are the b8ta testers, b8ta retail employees who assist customers in trying out the Neo smartpen. Neo’s success in b8ta stores is an excellent example of how the b8ta environment can change the discovery process for an impressive product. Only so much can be learned from a few photos and a description. Having read this, you’ve learned a bit about the Neo smartpen. We encourage you to visit a b8ta location, and see just how impressive the innovative products of the world are in person.